As of April 7, 2011, Mischa Mirin , MD , a member of the Thomas Jefferson University Hospital faculty and board certified in emergency medicine has volunteered to become the medical director for Southeast Pennsylvania Search and Rescue. Dr.Mirin is a graduate of Northwestern with intern and residency at Allegheny General, Pittsburgh , PA. The position of medical director oversees the quality of care provided by licensed emergency medicine system (EMS) providers in Pennsylvania. Under the PA Health Department EMS regulations issued on September 20, 2010 and effective this coming January, 2011, the EMS in Pennsylvania will become closer to the National Registry models for training and administration. Many categories of providers who were previously exempt from licensure, such as wilderness search, urban search, water search, mass care first aid stations, and SWAT, are now defined as special operations EMS agencies and must be licensed to continue operations. 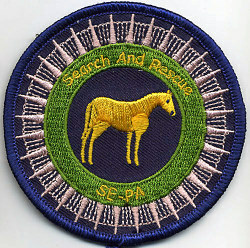 Southeast Pennsylvania Search and Rescue is a non-profit Pennsylvania corporation (IRS 501c3 public charity as well) organized to provide mounted wilderness search, large animal technical rescue expertise, and disaster assistance to communities requiring relocation or protection of livestock in the human food chain.